The indices suffered a correction on Monday itself and closed with losses over Friday’s close. On the NSE, there were 508 advances, 1,261 declines and 297 unchanged. Lending major HDFC Bank reported a 20.6% increase in its net profit to Rs5,005.73 crore during the quarter ended September 30, 2018. The Bank's total income for the quarter under review was at Rs28,215.2 crore, up by 21.2%. Net interest income (interest earned less interest expended) for the period grew by 20.6% to Rs11,763.4 crore, from Rs9,752.1 crore for the year-ago quarter, driven by asset growth and a net interest margin for the quarter of 4.3%. The indices of the Indian stock markets suffered further correction on Tuesday and closed with losses over Monday’s close. On the NSE, there were 510 advances, 1,241 declines and 309 unchanged. Negative global cues along with a worrying macro-economic situation and mixed start to the corporate earnings season subdued key domestic indices on Tuesday. The quarterly results were mixed adding to the negative sentiments among the investors. Selling pressure was witnessed in IT (information technology), healthcare, oil and gas counters. Bajaj Finance reported Q2 FY19 consolidated results with total revenue of Rs4,255.92 crore (Rs3,050.65 crore in the same period a year ago), up 39.5% year-on-year. Profit after tax was at Rs923.47 crore (Rs597.87 crore in the same period a year ago), up 54.5% year-on-year. Earnings per share were at Rs16.03 (Rs10.80 in the same period a year ago). TVS Motor reported Q2 FY19 standalone results of revenues of Rs4,993.47 crore (Rs4,064.72 crore in the same period a year ago), up 22.8% year-on-year. Profit after tax was at Rs211.31 crore (Rs213.16 crore in the same period a year ago), down 0.9% year-on-year. Earnings per share were Rs4.45 (Rs4.49 in the same period a year ago). Interim dividend of Rs2.10 per share was declared. Asian Paints reported Q2 FY19 consolidated results with revenues at Rs4,639.05 crore (Rs4,274.18 crore), up 8.5% year-on-year. Net profit was at Rs492.76 crore (Rs575.89 crore), down 14.4% year-on-year. Interim dividend of Rs2.85 per equity share was declared. 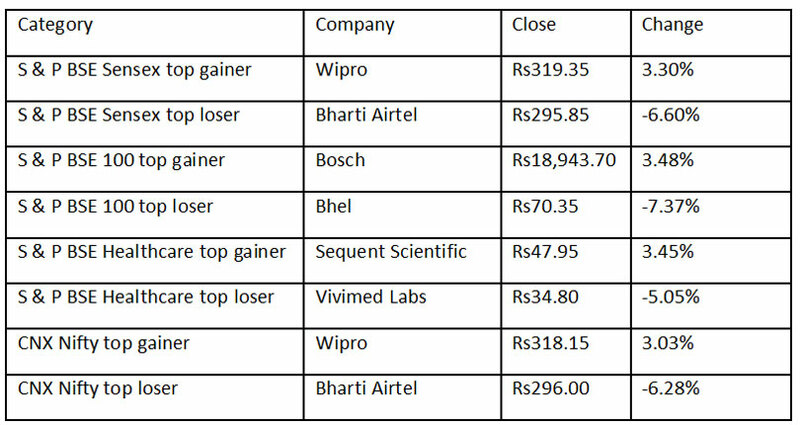 The major indices of the Indian stock markets rallied on Wednesday and closed with gains over Tuesday’s close. On the NSE, there were 956 advances, 794 declines and 308 unchanged. A recovery in the global markets coupled with a decline in the crude oil prices aided the domestic markets to trade in the positive on Wednesday. A recovery in the global markets has worked well for the domestic indices, which have shown some recovery. The ease in crude oil prices has also brought in some positivity in the markets. The domestic currency was trading at Rs73.29 to a US dollar from its previous close of 73.57. Also, the crude oil prices eased to $76.37 a barrel. Sundaram Clayton reported Q2 FY19 standalone results with revenues of Rs488.06 crore (Rs411.75 crore in the same period a year ago), up 18.5% year-on-year. Profit after tax was at Rs12.09 crore (loss of Rs40.15 crore in the same period a year ago). Earnings per share were at Rs5.97 (-Rs20.02 in the same period a year ago). Karur Vysya Bank reported Q2 FY19 results with net interest income (NII) at Rs579.14 crore (Rs555.01 crore in the same period a year ago), up 4.3% year-on-year. Net profit was at Rs83.74 crore (Rs75.65 crore in the same period a year ago), up 10.7% year-on-year. Provisions were at Rs213.14 crore (Rs321.36 crore in the same period a year ago). Gross non-performing assets (GNPA) were at 7.70% (4.83% in the same period a year ago). Net non-performing assets (NNPA) were at 4.41% (3.24% in the same period a year ago). The major indices of the Indian stock markets suffered a correction on Thursday and closed with losses over Wednesday’s close. On the NSE, there were 603 advances, 1,118 declines and 340 unchanged. Except for IT (information technology), oil and gas counters, all the sectors witnessed selling pressure led by banking, finance and healthcare stocks. The domestic currency was trading at Rs73.30 to a US dollar from its previous close of 73.15. Also, the crude oil prices continued to ease at around $75.76 a barrel. Maruti Suzuki reported Q2 FY19 consolidated results with total revenue at Rs22,433.2 crore (Rs21,768.2 crore in the same period a year ago), up 2.96% year-on-year. Profit after tax was at Rs2,240.4 crore (Rs2,484.3 crore in the same period a year ago), down 9.8% year-on-year. Earnings per share were at Rs74.17, down from Rs82.24 in the same period a year ago. Oriental Bank reported Q2 FY19 results with Net Interest Income (NII) at Rs1,274.83 crore (Rs1,251.73 crore in the same period a year ago), up 1.8% year-on-year. Net profit was at Rs101.74 crore (loss of Rs17,49.90 crore in the same period a year ago). Provisions were at Rs832.03 crore (Rs3,146.92 crore in the same period a year ago). Gross non-performing assets (GNPA) were at 17.24% (16.30% in the same period a year ago). Net non-performing assets (NNPA) were at 10.07% (9.44% in the same period a year ago). Negative global cues, along with a depreciating domestic currency, pulled the Sensex down on Friday. Nifty was down 95 points and Sensex fell 341 points. On the NSE, there were 747 advances, 964 declines and 346 unchanged. Cigarette-to-FMCG (fast moving consumer goods) major ITC Ltd on Friday reported a 11.9% increase in its net profit at Rs2,954.67 crore in the quarter which ended on September 30 of the current fiscal as compared to Rs2,639.84 crore. Its revenue operations were at Rs11,272.51 crore, up by about 15.5%. Its revenue from the cigarette business, during the September quarter, stood at Rs5,026.06 crore, up by 10.36%. ITC shares closed at Rs279.90, down 2.66% on the NSE. Biotech major Biocon Ltd has reported Rs355 crore consolidated net profit for the second quarter (Q2) of fiscal 2018-19, registering a record 416% growth from Rs69 crore in the like period year ago and 196% sequential growth from Rs120 crore quarter ago. Consolidated revenue from operations for Q2 grew 36% year-on-year (YoY) to Rs1,321 crore from Rs969 crore and 18% sequentially from Rs1,124 crore quarter ago. Earnings before interest, tax, depreciation and amortisation (Ebitda) also shot up 69% year-on-year to Rs394 crore and 28% sequentially. Biocon shares closed at Rs602.50, down 2.56% on the NSE. Negative global cues along with a weak rupee led the key domestic equity indices in the negative territory, on Thursday. Consequently, the barometer Sensex slipped below the 34,000-mark and the NSE's Nifty50 also dropped below the psychological 10,200 point mark. Except for IT (information technology), oil and gas counters, all the sectors witnessed selling pressure led by banking, finance and healthcare stocks. The domestic currency was trading at Rs73.30 to a US dollar from its previous close of 73.15. Also, the crude oil prices continued to ease at around $75.76 a barrel. Maruti Suzuki reported Q2 FY19 consolidated results with total revenue at Rs22,433.2 crore (Rs21,768.2 crore in the same period a year ago), up 2.96% year-on-year. Profit after tax was at Rs2,240.4 crore (Rs2,484.3 crore in the same period a year ago), down 9.8% year-on-year. Earnings per share were at Rs74.17, down from Rs82.24 in the same period a year ago. The company’s shares closed at Rs6,725.00, down 0.64% on the NSE. BHEL reported Q2 FY19 standalone results with income from operations at Rs6,606.90 crore (Rs6,168.36 crore in the same period a year ago), up 7.1% year-on-year. Net profit was at Rs185.17 crore (Rs115.42 crore in the same period a year ago), up 60.4% year-on-year. Earnings per share were at Rs0.50 (Rs0.31in the same period a year ago). BHEL shares closed at Rs69.90, down 7.97% on the NSE. Varun Beverages reported Q2 FY19 consolidated results with revenue at Rs1,204.4 crore (Rs988 crore in the same period a year ago), up 21.9% year-on-year. Net profit was at Rs42.2 crore (Rs32.8 crore in the same period a year ago), up 28.7% year-on-year. Earnings per share were at Rs2.31 (Rs1.80 in the same period a year ago). The company’s shares closed at Rs761.00, up 1.38% on the NSE. Bharti Infratel reported Q2 FY19 consolidated results with revenue at Rs1,720.2 crore (Rs1,658.7 crore in the same period a year ago), up 3.7% year-on-year. Profit after tax was at Rs599.8 crore (Rs638.4 crore in the same period a year ago), down 6% year-on-year. Earnings per share were at Rs3.24 (Rs3.45 in the same period a year ago). The company’s shares closed at Rs264.50, up 0.47% on the NSE. L&T Finance Holdings reported Q2 FY19 consolidated results with total revenue at Rs3,246.30 crore (Rs2,596.72 crore in the same period a year ago), up 25% year-on-year. Net profit was at Rs560.41 crore (Rs337.53 crore in the same period a year ago), up 66% year-on-year. Earnings per share were at Rs2.81 (Rs1.85 in the same period a year ago). The company’s shares closed at Rs119.00, down 6.08% on the NSE. Larsen & Toubro Infotech reported Q2 FY19 consolidated results with revenue at Rs2,331.2 crore (Rs1,750.8 crore in the same period a year ago), up 33.2% year-on-year. Net profit was at Rs400.1 crore (Rs272.6 crore in the same period a year ago), up 46.8% year-on-year. Earnings per share were at Rs23.14 (Rs15.95 in the same period a year ago). The company’s shares closed at Rs1,640.10, down 1.11% on the NSE. M&M Financial reported Q2 FY19 standalone results with revenue at Rs2,103.26 crore (Rs1,517.38 crore in the same period a year ago), up 38.6% year-on-year. Net profit was at Rs381.39 crore (Rs164.01 crore in the same period a year ago), up 132.5% year-on-year. Earnings per share were at Rs6.21 (Rs2.90 in the same period a year ago). The company’s shares closed at Rs408.00, up 1.75% on the NSE. Wipro reported Q2 FY19 consolidated results with revenue at Rs14,541 crore (Rs13,423.4 crore in the same period a year ago), up 8.3% year-on-year. Net profit was at Rs1,889 crore (Rs2,191.8 crore in the same period a year ago), down 13.8% year-on-year. Earnings per share were at Rs4.19 (Rs4.52 in the same period a year ago). The company’s shares closed at Rs318.15, up 3.03% on the NSE. Interglobe Aviation reported Q2 FY19 standalone results with revenue at Rs6,185.3 crore (Rs5,290.0 crore in the same period a year ago), up 16.9% year-on-year. Net loss was at Rs652.1 crore (Rs551.5 crore in the same period a year ago). Earnings per share were at a negative value of Rs16.96 (negative value of Rs15.19 in the same period a year ago). The company’s shares closed at Rs884.00, up 8.23% on the NSE. Oriental Bank reported Q2 FY19 results with Net Interest Income (NII) at Rs1,274.83 crore (Rs1,251.73 crore in the same period a year ago), up 1.8% year-on-year. Net profit was at Rs101.74 crore (loss of Rs17,49.90 crore in the same period a year ago). Provisions were at Rs832.03 crore (Rs3,146.92 crore in the same period a year ago). Gross non-performing assets (GNPA) were at 17.24% (16.30% in the same period a year ago). Net non-performing assets (NNPA) were at 10.07% (9.44% in the same period a year ago). Oriental Bank shares closed at Rs66.35, up 6.33% on the NSE. NBCC has received LoA (letter of assurance) worth Rs902 crore from Ministry of Health & Family Welfare, Government of India for Planning, Designing, & Construction of AIIMS, Deoghar, Jharkhand under Pradhan Mantri Swasthya Suraksha Yojana (PMSSY). NBCC India shares closed at Rs54.55, up 2.44% on the NSE.